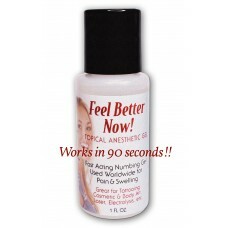 Feel Better Now Topical Anesthetic Gel is used DURING a procedure. This gel formula has a quicker numbing agent then most other topical anesthetic gels. It has 5% lidocaine, 2% tetracaine and 0.02% epinephrine which works in 90 seconds to help relieve pain, swelling and bleeding. It can be used for body art and cosmetic tattoo procedures, and unlike many other topical anesthetics, can be used safely around the eyes. So, if you need a product you can count on to keep your client in a more comfortable state, Feel Better Now Topical Anesthetic Gel is the solution!! Directions: As soon as the skin is broken, apply a thin layer of Feel Better Now Topical Anesthetic Gelover the area being worked on and wait approximately 90 SECONDS for the ultimate numbing experience. As you continue working, repeat the process, if needed. 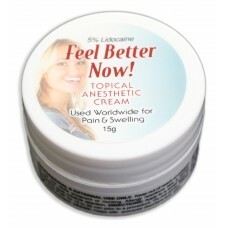 Also: See Feel Better Now Topical Anesthetic Cream for use PRIOR to a procedure to help with the initial discomfort. Feel Better Now Topical Anesthetic Cream is used PRIOR to a procedure. It can help take off the edge to help relax your client as the procedure begins. This 5% lidocaine formula can be ..